Noise Figure (NF) describes the amount of noise a component, amplifier, or an entire radio receive chain contributes to the RF signal being received. 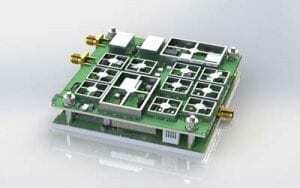 Electrical noise is combined with the RF signal as it is generated by the RF transmitter and propagated through space. This signal is then captured by the receiving antenna and guided to the receiver input via a transmission line. In an ideal receiver, each amplifier stage would increase the desired signal and the surrounding noise floor by the same amount, or in other words, the amplifiers would not add any additional noise to the signal. This would mean that the signal to noise ratio (SNR) would remain constant throughout the stages of the receive circuit. In reality, amplifier stages add additional noise to the signals passing through them. In the worst-case scenario, this means that through several gain stages the noise floor rises at a greater rate than the desired signal level, which and can eventually envelop the desired signal and prevent reception of the signal altogether. In an effort to reduce cost, the radio designer may select inexpensive transistors or amplifier ICs for the receiver gain stages. Unfortunately, these devices may not be designed for low noise applications and will have poor NF performance. For a high-performance receiver, all gain stages should have the lowest possible NF values. However, because this may be cost prohibitive, significant improvement in system NF is achieved by simply insuring that the first gain stage is a quality LNA device. There are two options for implementation of the LNA in existing equipment: (1) the first gain stage in the receiver is replaced with a low NF device by the original equipment manufacturer (OEM), or (2) an external LNA is placed between the antenna and the receiver. 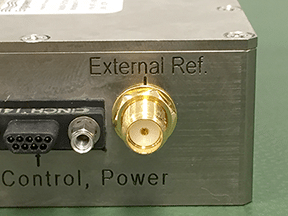 In many instances, adding an external LNA presents the most cost-effective option when compared with the costs of a modification to an existing receiver. The addition of the NuWaves µHILNATM (Figure 3) to the front end of a receiver with a high NF has improved the receiver noise figure by approximately 2 dB. Figure 3. 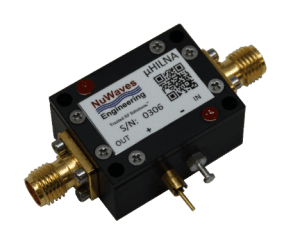 NuWaves’ µHILNATM Low Noise Amplifier (LNA) operates from 50 to 1500 MHz, delivers 20 dB of gain, with less than 1 dB of Noise Figure (NF) and a Third-Order Intermodulation Product (IP3) of +31 dBm. Noise figure is a key measurement of the performance of an RF receiver. While the peak performance is gained by selecting LNA devices with the lowest possible noise figures, good performance is achieved by using a high quality, low noise figure device as the first gain stage in the receiver. Further, the noise figure of a receiver can be improved through the addition of an external LNA placed between the receive antenna and the receiver. 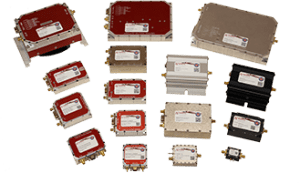 NuWaves offers several LNA modules in the NuWaves product line, including the µHILNATM, providing low noise gain solutions from 2 MHz to 10 GHz.